‘Nightfall nears the Malacca Strait. 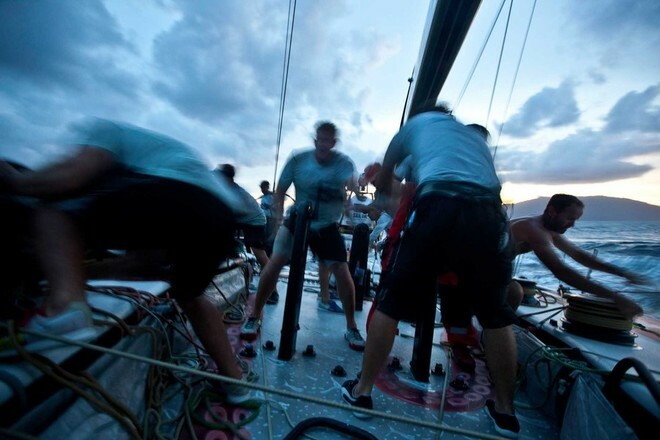 PUMA Ocean Racing powered by BERG during leg 3 of the Volvo Ocean Race 2011-12, from Abu Dhabi, UAE to Sanya, China. The overall race leader, Spain’s Telefonica has made a split with the rest of the fleet in the Volvo Ocean Race, and at the latest position report has given up the lead to the US entry Puma Ocean Racing. On the water using the snap-shot distance from the race finish in Sanya, China, Volvo Ocean Race organisers are showing the Iker Martinex skippered entry as being just 1nm closer to China than Ken Read’s Puma. 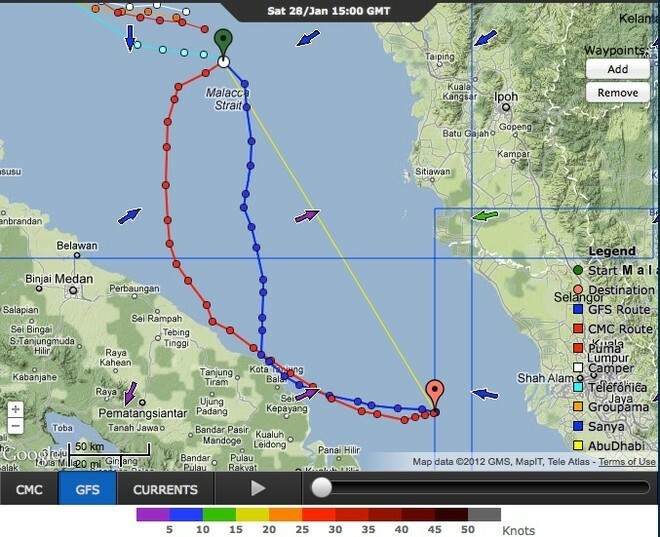 Sail-World using the routing functions of PredictWind, and based on the distance and time left to run to the next waypoint in the Mallaca Straits between Malaysia and Sumatra, confirms that Puma should round about a mile ahead using one route option, and will still be ahead using a second course option, but will have to sail further than Telefonica, using that option which takes her closer to the Malaysian coast. The explanation for how one boat can be faster, but sailing a longer distance is usually explained with variance in windstrength and direction. 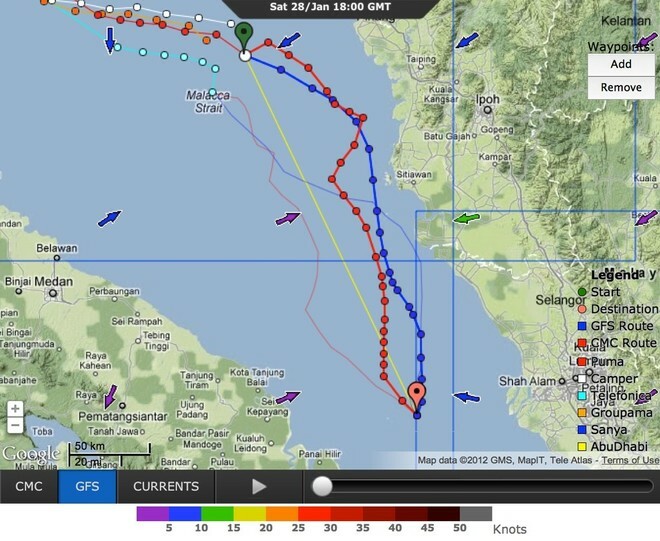 As can be seen in the course images from Predictwind the wind is blowing offshore from both sides of the Mallaca Straits – which makes a challenge for the navigators as to which side is favoured, it would seem that Telefonica prefers the Sumatra side of the Strait, while Puma is heading for the Malaysian side. The bottom line is that the winds are quite fickle in direction and strength with both Puma and Telefonica predicted to experience wind strengths of just 2-3kts for about three hours or so, regardless of which course they take, with windstrength reach up to 9kts elsewhere. With the Volvo 70’s beings able to sail at almost a kt of boatspeed for every kt of windspeed this variance in wind strength is significant, and will be a major factors as navigators and tacticians select their course options. 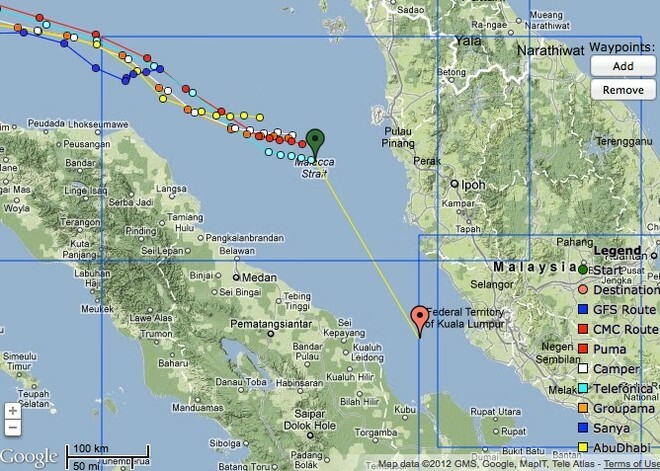 On one prognosis, Camper (Chris Nicholson) is predicted to move into second place at the Mallaca Straits waypoint. On that prognosis she will round 90 minutes after Puma, and 90 minutes ahead of Telefonica. Currently the fleet is about 20hours at the most optimistic prognosis more likely to be 24 hours away. After the way point the fleet turns at Singapore before heading for China.